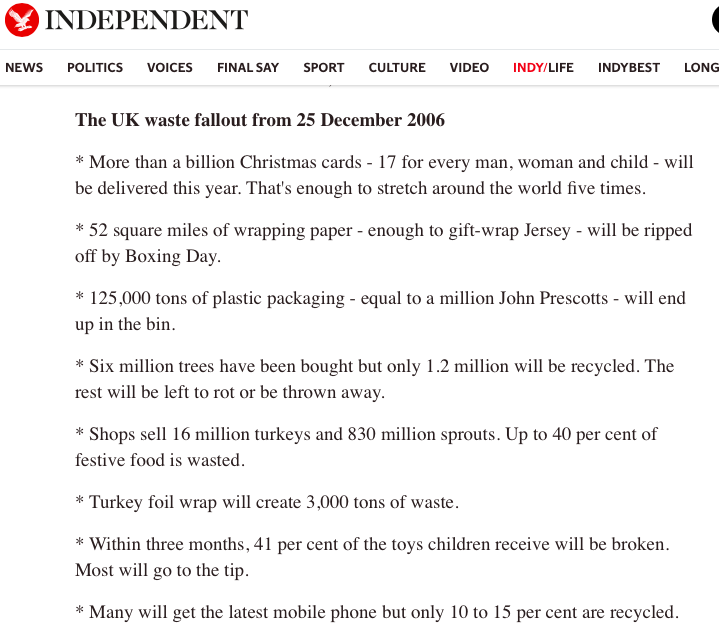 Is Your Christmas and New Year Celebration Environmental Friendly? Think of your Christmas and New Year Celebrations, and the visuals are cheerful moments of shopping, spending time with family, parties, beautifully decorated Christmas trees, lots of food, sweets and many more. Although, the celebration looks great and delightful, but if we ever think does Mother Earth also has the same opinion. Considering this number, the total number of Christmas trees used across the globe could be anywhere between 1 – 2 billion i.e. approximately 10 % percentage of the trees cut down by humans globally. All these are alarming for the environment. Apart from this, transporting Christmas tree is another environmental hazard. To reduce this impact, a potted Christmas tree can be the best option and it can be reused every year. 2. Shopping: Many of us end up buying extra clothes during Christmas and New Year sale. Most of the time we end up buying more than we even need. All these unused clothes contribute to be a major part of the landfill which puts enormous stress on the earth to decompose synthetic, plastic, and other artificial fibres. 3. Gifts and wrappers: On an average, a family buys 5 gifts on every Christmas and many times they are just to keep up with the tradition. Gift means wrapping as most of us do not give open gifts and like to wrap them with best possible decorative cover but the papers used for gift-wrapping are not recyclable as they are laminated by plastic, foil or other non-paper material. Americans throw away 25% more trash during the Thanksgiving to New Year’s holiday period than any other time of year. This extra waste amounts to 25 million tons of garbage, or about 1 million extra tons per week! 4. 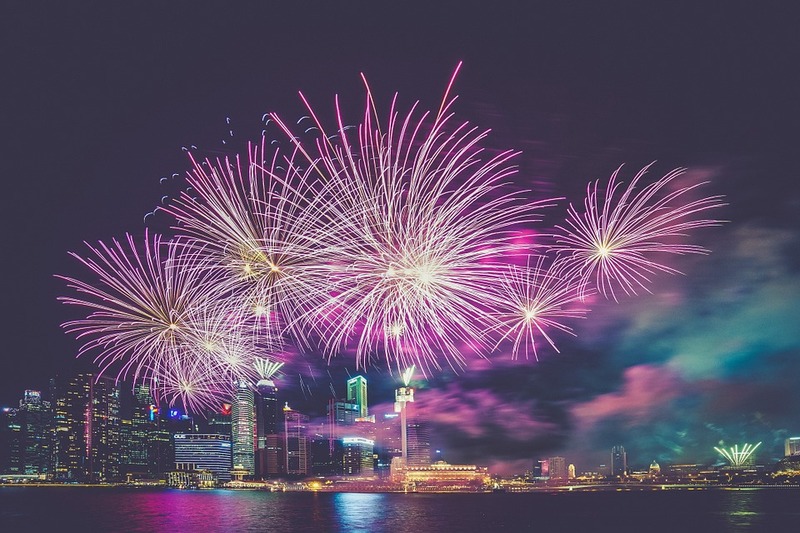 Fireworks: Tons of fireworks are used for New Year celebration across the globe. As per BBC, German National figures suggest that firework displays emit around 4,000 tons of particulates into the atmosphere. 5. Decorations: Most of the Christmas decorations are also not environment friendly as they are all manufactured from plastic and other hazardous material. They look appealing and beautiful but has anyone ever thought about the harm it does to the nature after it is discarded. Most of the above list are non-biodegradable, so are sent to landfill or are incinerated. Additionally, there are other wastage such as food, light, air and pollution caused by batteries used in toys and other equipment’s etc. Check out following tables to understand the magnanimity of the wastage. Christmas Food also contribute a lot of pressure to mother nature as extra cooking, drinking and overeating are always been part of festival and celebrations. As per the data, the food consumption is 80% more than rest of the year. Along with consumption, the binning of 230,000 tons of food during the Christmas period is equally bad for the environment and on animals who are killed during the season every year. However, the efforts are almost negligible, as other government bodies across the globe are either doing very little or doing absolutely nothing. Christmas is celebrated to remember the birth of Jesus Christ, who is believed to be the Son of God. Jesus always preached to spread love and harmony. The Bible verses also quote’s – For I know the plans I have for you,” declares the LORD, “plans to prosper you and not to harm you, plans to give you hope and a future. So, we should make every effort to protect and safeguard our beautiful mother nature. 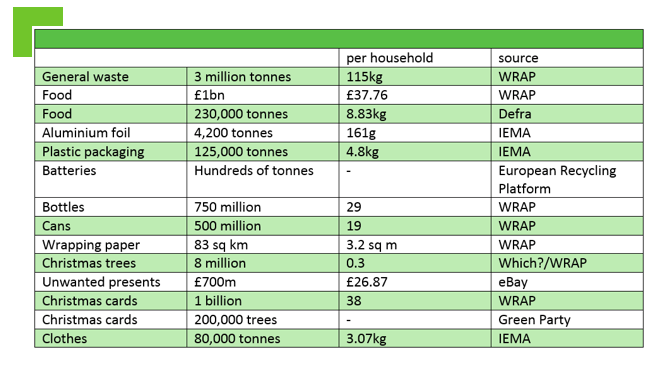 This data is published by Commercial waste in 2016.